Full Summary: Michael Doyle will address the challenges of making food safe, from the farm to the point of consumption. The Centers for Disease Control and Prevention (CDC) estimates that 48 million cases of foodborne illness occur annually in the U.S., with most being of microbial origin. Michael Doyle has spent his career developing better ways to detect and control the harmful microbes associated with foods. He will address many of the challenges of making food safe, beginning at the farm to consumption at the table. 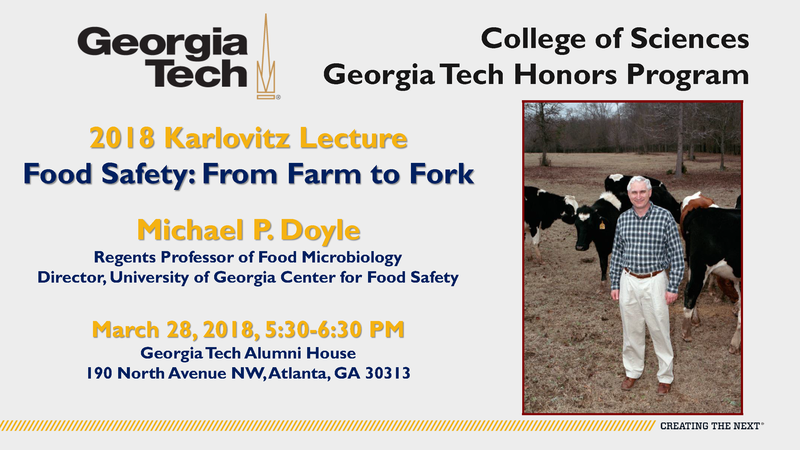 Michael P. Doyle is Regents Professor of Microbiology and Director of the Center for Food Safety at the Universtiy of Georgia. His research has focused on food safety and security. He has worked closely with the food industry, government agencies, and consumer groups on issues related to the microbiological safety of food. Doyle has served on the food safety committees of many scientific organizations and as scientific advisor to many organizations, including the CDC, Environmental Protection Agency, Food and Drug Administration, U.S. Department of Agriculture, U.S. Department of Defense, and the World Health Organization. He is a Fellow of the American Academy of Microbiology, the International Association for Food Protection, and the Institute of Food Technologists. He is a member of the National Academies’ Institute of Medicine. The lecture is made possible by an endowment in memory of College of Sciences Dean Les Karlovitz, who served as dean for 16 years until 1989. Seeking to broaden intellectual discourse on campus, the series focuses on speakers whose work has led them to stretch across disciplinary boundaries.